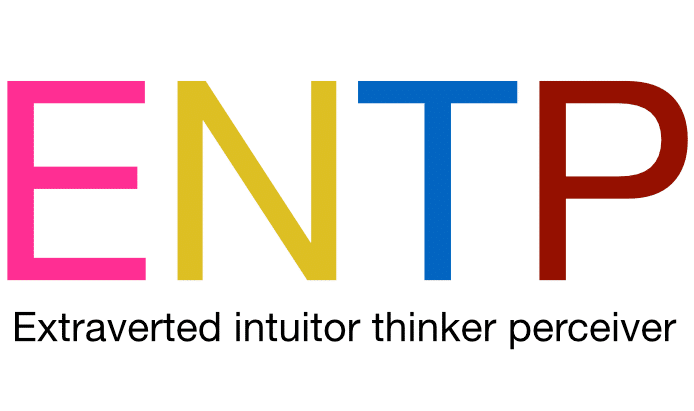 The Perceiver element of the ENTP personality type means that Intuition is extraverted with this personality type and Thinking is Introverted. Their preference for their processing is how they take in information (Perceiving) which in this case is through Intuition rather than Sensing. Extraverted intuitors experience the outer world noticing possibilities, and what could be. 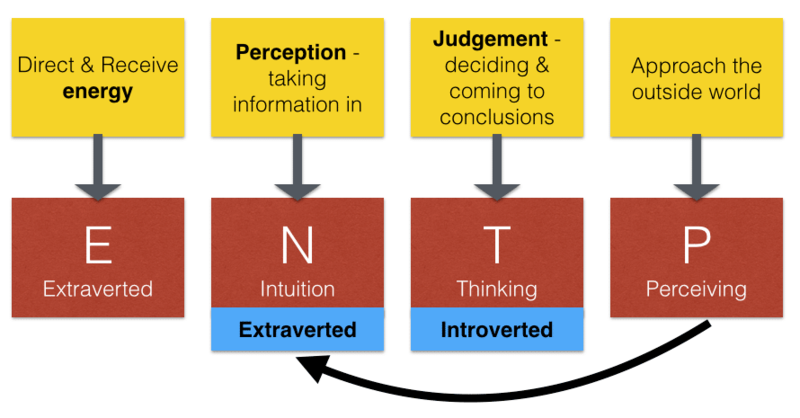 Their personality dynamic is therefore Extraverted Intuition with Introverted Thinking. Their third preference is Feeling and their inferior function is Introverted Sensing. He is responsible for future developments in the way we deal with customers. He is constantly looking at the current environment and situation, within our organisation and the customer’s, for opportunities and possibilities. He is definitely a big picture person, give him too much detail and his eyes glaze over – it’s amusing to watch the dynamics between detail-mad engineers and him. He is adept at analysing systems, particularly organisational systems and working them to achieve his aims – he has just been promoted into another new post. To him there are endless possibilities, interesting concepts and exciting challenges. They are stimulated by difficulties, quickly devising creative responses and plunging into activity, trusting their ability to improvise. He can create seemingly meaningful statistics at will and then be nimble enough to plausibly justify them to a variety of people. We get on well, the only significant difference between us is his Extrovertness and me being an Introvert. In all other areas we match each other and share similar views. I still work with her in short-term projects once in a while. She has extrovert written all over her with all the distinguishing qualities of an extrovert and more. She is never shy to be in the middle of a room socialising with people, even when she has price tags dangling from her new nice clothing which she has just bought for the occasion or has worn mismatching colour of her same style shoes, and if someone brings this to her attention she’d have a temporary moment of embarrassment and a good laugh and then continue with her incoherent chatter while her eyes wonder around the room. She often realises what she’s just said and goes “Ooops” and moves onto saying more ooops things. She likes standing close to and touching people while conversing. She has a huge network of friends, and despite her busy schedule she finds a lot of time to spend on Facebook and catch up with everyone. One can get all updates from her. She doesn’t like to be alone and makes sure she is always in a group. People also enjoy her bubbly company. Multi-tasking’ is an understatement for this woman. She can check and reply e-mails while going through paper on her desk and conversing with a colleague at a social level and suddenly switching to ask “can I say this in my reply?” and you don’t even know what she’s talking about, and the next moment she also picks up the phone to talk to her husband and give him home management instructions, and if you make a move to leave because she seems so outrageously busy, she signs to you to sit because she has time for you too. Her desk is so chaotic and dirty with crumbs and coffee spills and one wonders how she’s made it to top management, and yet one shouldn’t wonder because she is an intuitor and predominantly a thinker. Her work requires her to deal with lots of data but she doesn’t like details and would rather delegate those kinds of tasks to her team, and work with the bigger picture. She always wonders what all those regional directors are trying to achieve with the different strategies and how they all fit together globally and what the implications are for our local situation. She is not happy when things are not clear. She doesn’t like to get down to work but she always wonders, and somewhere along the line she has developed those irritating devil’s advocate thinking skills. Try any argument with her she can quickly come up with a counter argument just for the sake of it. She is a fair and good person and does care for people, so when the management team was faced with announcing redundancies due to a downsizing and restructuring in the organisation, she was concerned about people; at the same time, I remember that she rationalised her role as “we get paid top management salaries because we are expected to make difficult decisions like this”. She is one of those who tries to be objective and logical, and fair and just at the same time. She doesn’t hesitate even for a moment to express her disagreement even with the Chief Executive and Regional Directors or whoever, and can be quite aggressive in making her point. I think she oscillates along the perceiver/judger scale, at least at work. She is definitely not organised herself, and she prefers externally imposed fixed patterns and structures not so much because she enjoys them but because she can get lost if she is allowed too many options and a lot of flexibility even though this might be her natural preference. She is a perceiver in the sense that she is very laid back and wouldn’t care about time and schedules unless she is warned. She displays signs of creativity in her speech but definitely not in her actions perhaps because she is all over the place and doesn’t channel her creative energy. Even though it bothers her that so many things stay unfinished and so many meetings have no outcome it is actually her lack of focus, and digressing and getting distracted a lot in work and in meetings which prevents her from having closure.